[C9] Notice - Vote for C9 and get special gifts & events! We are pleased to inform that C9 has been nominated for 2 Awards on "2017 MMOsite Reader's Choice!" It's your time to cast your vote for C9! Many drops make a shower, and your precious vote can make C9 win the 1st place. You can make it happen! Best PVP: Click once more! 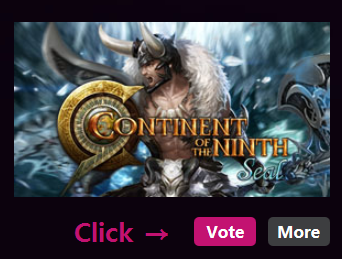 Find "C9" and click [Vote] button! To thank our previous voters, we are giving out promotion codes. Get Free Item Redeem Codes! ** All items are bound to the character. How to redeem the code? Enter the Redeem Code here: Go to the Redeem Code page. Select the game, server, and character you want to receive the items. Enter the code (without hyphens). The items will be delivered to the storage of the character you selected. The 1st round will only be open until December 20th, 2017, and you can vote once everyday REPEATEDLY! So hurry up to cast your vote today, and don't forget to vote again tomorrow! We are looking forward to seeing the best selection of actionists!